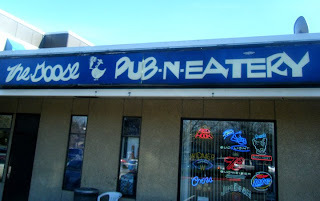 I'm not particularly fond of Bellevue, and I've previously posted my opinion on utterly banal sports bars. But for some reason the Goose Pub'n'Eatery, while it's not about to make any of my favorite lists, seemed substantially more pleasant than usual. Maybe it was because it was lunchtime, or because of the non-Bellevueish, non-sportsbarish people there. Or maybe it was just sitting down the bar from an elderly regular called "Tiny," drinking his mini-pitcher of Mountain Dew. When I asked the friendly woman working the bar about him, she said, "Tiny? Oh yes, he's quite the regular." Then added, "He's quite the dirty little old man too." The way she said this made it seem charming, not disturbing, so I just left it at that.